Freiburg in Breisgau is known as the sunny pearl of Baden-Württemberg; besides its lovely weather, the city is known above all for the Münster Cathedral, the University, and its vineyards. Locals and tourists alike prize the outstanding liveability of the city, which is primarily due to its many parks, tree-lined city streets, and green areas. Freiburg’s Münster Cathedral, one of the oldest churches in Europe, is famous around the world. Tourists who climb the steps to the top of the tower will be rewarded with a breathtaking view of the city. Every morning, a market is held on the square around the Münster, offering plenty of fresh products from around the region. Münsterplatz also has plenty of other culinary delights to offer, such as the famous “Lange Rote” (Long Red), a sausage specialty, or the great wine bar at the historic Alte Wache. Münsterplatz is surrounded both by historic buildings such as the deep red Historischen Kaufhaus (Historic Merchant’s Hall) or the Kornhaus, and by typical Freiburg Bächle, small runnels of water which run through the city. These small canals are seen as historic symbols of the city. The saying goes that if you accidentally step into one of these channels, you will marry a man or woman from Freiburg later in life. Most of Freiburg’s historic city center was destroyed in the Second World War, but was rebuilt afterwards in a style true to the original. Miraculously, the Münster, the southeastern corner of the Münsterplatz, and the two remaining medieval city gates (the Schwabentor and the Martinstor) remained unharmed. Thanks to the diverse green areas all over the city, Freiburg has plenty of relaxing oases to offer. Seven protected natural areas are found within the urban area alone, including Arlesheimer lake to the west of the city. Visitors who want to learn something new while they relax will enjoy a visit to the Botanical Garden. Among other universities, Freiburg houses one of the oldest and most highly renowned colleges in Germany with its Albert-Ludwigs-Universität, founded in 1457. The student scene is diverse and lively, and visitors can experience it at one of the many cafés and bars around the university. Tourists can get to know the history of the university in the Uniseum, a museum in the older section of the grounds. The biggest museum in Freiburg is the Augustinermuseum, offering an impressive collection of artworks and cultural treasures that date from the Middle Ages to the 19th century. The Freiburg Nature Museum is also located on Augustinerplatz, and houses wide-ranging natural science and anthropological collections. The Black Forest near Freiburg invites guests to hike or take a pleasant day trip. One favorite destination are the ruins of medieval Zähringer Castle, of which only a crenellated turret with viewing platform remains today. Tackling one of the many hiking paths through the Black Forest opens up new and rewarding views of Freiburg. 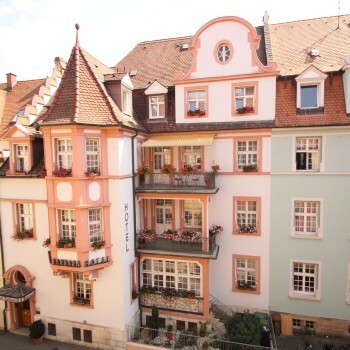 Get to know the best side of the green city of Freiburg in Baden-Württemberg personally, and book your vacation at one of our PrivateCityHotels., or choose one of our hotels in Austria, Germany, or Switzerland.